Neuville-St. Vaast is a village about 6 kilometres north of Arras and 1 kilometre east of the main road from Arras to Bethune. 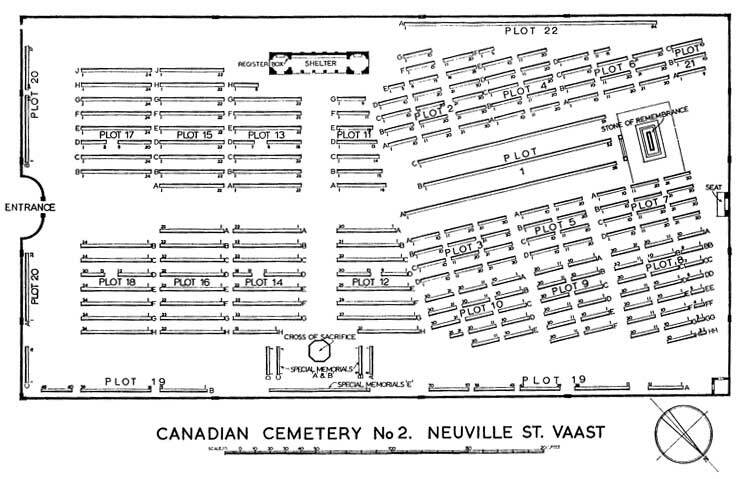 The Cemetery is within the Canadian National Vimy Memorial Park, which is north of Neuville-St. Vaast. The main entrance to the Park is signposted from the Arras to Lens road (N17). There are nearly 3,000, 1914-18 war casualties commemorated in this site. 29 Canadian soldiers buried at the time in the 11th Canadian Infantry Brigade Cemetery, Givenchy-en Gohelle and the Canadian cemetery near Gunner's Crater, Givenchy-en-Gohelle but whose graves are now lost are commemorated by special memorial headstones, inscribed to this effect with the additional quotation, "Their Glory shall not be blotted out".